In the modern world, electricity is deemed a necessity – powering up households and businesses which in turn drives economic growth. It also makes life more comfortable and innovation possible. But given the urban-rural divide which is prevalent almost everywhere in Southeast Asia, electricity is somewhat a luxury to some – especially for those living in far-off rural areas. In Indonesia, according to the Asian Development Bank, as of 2016, 10.4 million, mostly rural households, lived in the dark. 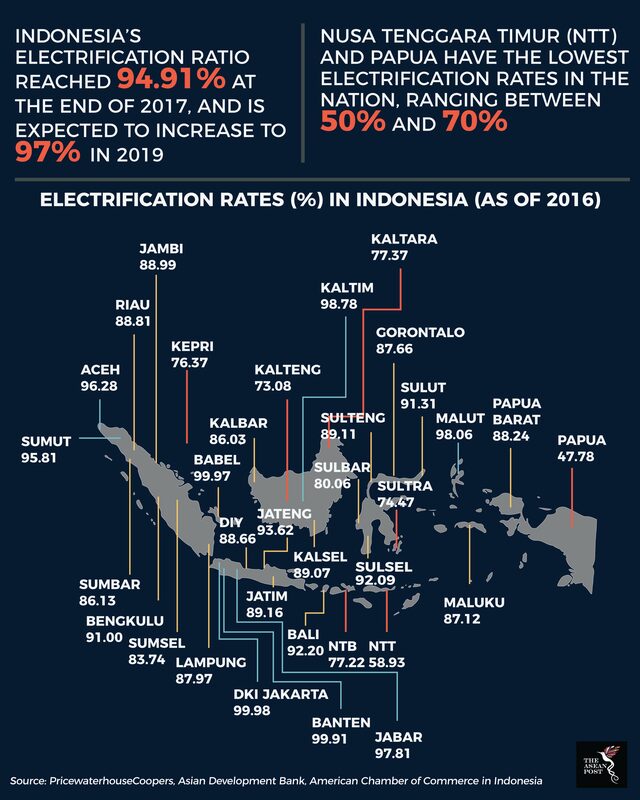 Electrification in the country has improved significantly reaching close to 95 percent at the end of 2017 as was highlighted by the American Chamber of Commerce in Indonesia. It is expected to increase to about 97 percent in 2019 and ultimately 100 percent by 2020 in accordance with The National Policy adopted in 2014. However, to achieve that goal, the country must focus on bringing electricity to rural areas, where the vast majority of unelectrified individuals reside. Ensuring access to electricity, falls under the purview of the government and regional governments (Pemerintah Daerah or Pemda). Together, they must ensure enough funding for electricity supply and the development of electricity infrastructure in remote, underdeveloped regions of the country. With electricity consumption ever on the rise – from 1,012 kWh/per capita in 2017 to 1,200 kWh/per capita in 2019 – they must move quick. However, with most of urban Indonesia electrified, the challenge is to electrify its rural areas. According to a 2016 report by the Asian Development Bank, generally, the challenge is to connect the last 10 to 15 percent of the population to the national grid. The report adds that it can take upwards of 20 years to reach an electrification ratio of 100 percent which can be made more difficult by a myriad of factors. For Indonesia, the main stumbling block towards achieving universal electrification is its geography. Indonesia is an archipelagic nation with approximately 17,000 islands spanning 5,000 km. Most of its rural terrain is made of dense rainforests which makes it difficult to build electricity infrastructure like transmission towers and substations. Over 2,500 villages have yet to gain access to electricity but the state electricity authority (PLN) aims to change that by building more power plants. However, that would only cover approximately 500 villages, leaving 2,000 still in the dark. Hence, the solution is to turn to off-grid programs, where electricity is generated on site especially from renewable energy resources. The Indonesian government has issued a ministerial decree in 2016 to accelerate the electrification of underdeveloped rural areas via the implementation of small scale electricity supplies like solar energy. A key enabler of this solution is public-private partnerships. Phillips, a globally renowned lighting brand came up with the idea of the Bright Energy-Saving Villages initiative. It would provide rural villages in the remote areas of Central Borneo, North Sumatera, East Bali, Maluku and South Sulawesi with LED-solar street lighting. So far, 2,886 lighting points have been built. Besides that, French based Akuo Energy has embarked on a project of rural electrification which promises to deliver electricity to distant villages in East Kalimantan by March 2018. Villages will be served by a 1.2-megawatt (MW) hybrid power plant which consists of solar photovoltaic (PV), lithium-ion energy storage and a distribution system. Given that renewable energy systems are more scalable, it is more applicable for use in generating power in rural areas – compared to big and expensive diesel generators. The increased deployment of renewable energy solutions to power rural villages will help Indonesia reach its goal of having 23 percent of its energy mix derived from renewable sources by 2025. In a report published in 2017 by the International Renewable Energy Agency (IRENA), renewable energy use in Indonesia will continue being the highest in power generation for years to come. As the government aims to assess the potential of renewable energy in the country, several predominantly rural areas like Kalimantan, Maluku and Papua were distinguished as testbeds. This goes to show that in ensuring a sustainable future, the focus of development should not be concentrated in urban areas alone but rural potential can be harnessed and used as a “test lab.” As Indonesia strives to deepen its electricity penetration to rural villages, that experience will undoubtedly help shape any future endeavours in sustainable development.